The top three achievers in the commerce stream at the 2017 GCE Advanced Level exam were recently awarded with scholarships from the Institute of Chartered Accountants of Sri Lanka (CA Sri Lanka) to kick start their professional journey as globally sought after Chartered Accountants. The CA Sri Lanka scholarships were presented to the island’s first in the commerce stream Ms. Dulani Rasanthika of Sujatha Balika Vidyalaya, Matara, island second Ms. Kaushalya Subashani Dabare of Musaeus College, Colombo and island third Ms. Aqeela Izwer of St. Paul’s Girls school, Milagiriya. Congratulating the three highest achievers, President of CA Sri Lanka Mr. Jagath Perera said that in its capacity as an influential professional body and a leading tertiary education provider, the institute is committed to playing a critical role in building a strong breed of leadership who is geared with the knowledge and expertise to lead Sri Lanka with a bold vision and strong principles. “In this endeavor, we are happy to have attracted some of the country’s best talent including the top three achievers in the commerce stream who have performed exceptionally well at the 2017 Advanced Level exam. We believe they will be part of the future who will use their specialised financial and business acumen to give leadership to corporates in the future,” he said. Chief Executive Officer of CA Sri Lanka Aruna Alwis noted that the institute is taking every effort to ensure students from across the country have access to a globally recognized qualification in accountancy. 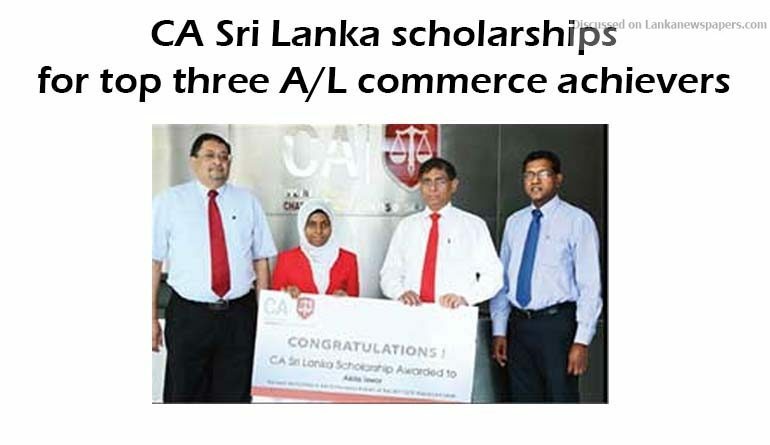 “Not only is the CA Sri Lanka qualification followed by students from the commerce stream, but it has also become a qualification of choice of students from other streams including maths, arts and sciences,” he said. Alwis added that to ensure that the CA programme continues to be relevant, the institute continuously update the curriculum by taking into consideration current and future market needs at a local and international context. He said that the revamped syllabus aims to produce chartered accountants for 2020 and beyond who are highly skilled, competent and multi-faceted professionals having the ability to create value, enable value, preserve value and report value for the organisations they serve in. The CA Sri Lanka qualification is open to students who have obtained a minimum of three simple passes in any stream at the GCE Advanced Level exam.